The First Gallery here in Southampton has to be the most unusual art gallery I’ve ever visited, and certainly the most unusual I’ve exhibited in. Run by mother and son team, Margery and Paul Clarke, the gallery was set up in their home in the late 60s with the remit of providing a small, personal space in which professional artists can sell their work, and those with an interest in art can view and buy the work, having seen what it might look like in a domestic setting. The gallery has grown in reputation over the years whilst remaining small and personal. 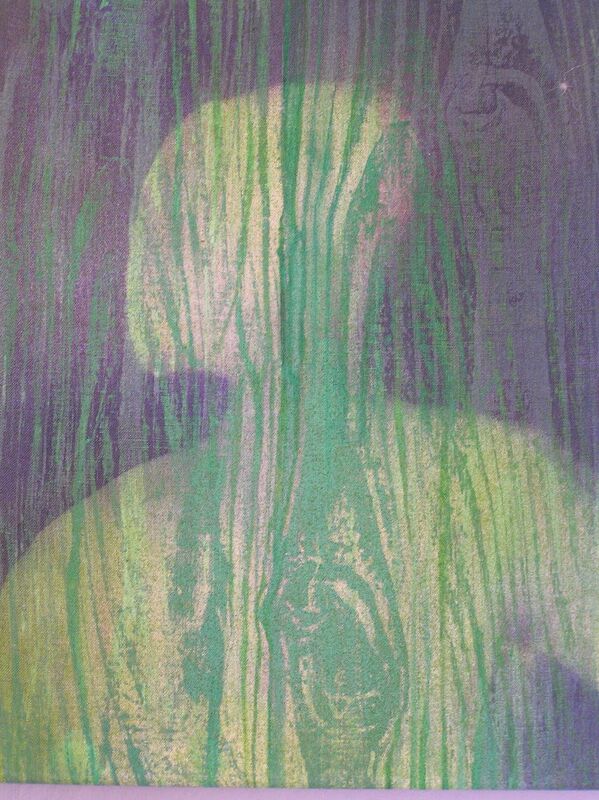 I was pleased to have a print selected for the gallery’s exhibition entitled The Green Man. 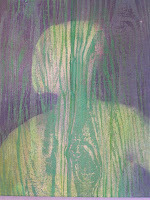 The show centred on a series of prints and paintings by Elizabeth Nash based on the subject of the green man (more information here). This was complimented by work on the same theme from other local artists including fellow Red Hot Press members Sue Anderson and Tamsin Loveday. As well as print, there were works in a variety of media; drawing, painting, bas-relief & wicker, sculpture, book-works, digital photography and textiles. My own piece was an aquatint of a Woodwose or wild man, a sort of distant relation of the green man, explained here in my blog post about the print. There. Not everything's about the royal wedding today. Private views were a bit like buses at the beginning of April; none for months then two in five days. Red Hot Impressions which runs from 5 April to 18 June 2011, is the first collaboration between Red Hot Press Printmaking Workshop and The Art House, Southampton’s not-for-profit café gallery and arts venue. It’s a great venue right in the city centre so we were very excited to be asked to show there. The Art House has a lively programme of events including art, music and poetry, and workshops in just about anything you can think of, from English folk fiddle to drumming, and sign language to beadwork. They even run a workshop on how to run a workshop! The venue also provides a meeting place for a number of groups which include writers, knitting, language café and a group which makes stuff out of scrap anything – very much in line with The Art House’s green ethics. The café serves vegan food prepared and cooked on site, grown organically and locally sourced where possible. And those who run the show, mostly volunteers, are great. What’s not to like about this place? Red Hot Impressions includes original prints from sixteen members of Red Hot Press and covers a wide range of printmaking techniques; etching, linocut, woodcut, drypoint, letterpress, screen printing, collagraph, gum transfer, monprinting… I’ve probably forgotten some. A full and varied show! We had fun hanging the exhibition - a team of seven of us did it in just under three hours, and during that time, I think we put every print on just about every screw in the gallery! It all came together really well in the end though. Here’s the Art House’s blog with some pictures of us hanging the show. The opening was well-attended; the wine flowed, thanks to the Art House crew, and work sold. All in all, a very pleasant evening. More pictures here. If you haven’t paid a visit to The Art House, jog on down and have a coffee and some of their superb home-made cake - surrounded by excellent works of art of course! 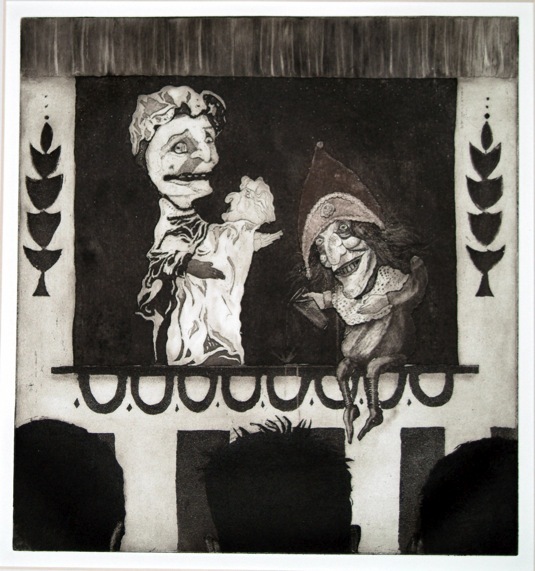 Weekend before last, I was fortunate to be able to attend an etching master class at Red Hot Press taught by Andrew Baldwin, etcher extraordinaire and non-toxic printmaking evangelist. The weekend started on Friday evening with Andrew giving a talk about how he’d got into printmaking and why he’s particularly keen to make it as non-toxic as possible. Having come from a family of commercial printers, Andrew feels that printing is in his blood. It was his interest in art however which led him to apply for a job as a print room technician at Aberystwyth University where he has taught for the last twenty years or so. It was there that he first discovered (and was smitten with) etching. Problems with the etching bath ventilation system and his father’s health problems following a life time in the printing trade lead Andrew to start thinking about the hazards of printmaking, in particular etching; he told us horror stories about dissolving tooth enamel and exploding fingers. There are a myriad of dangers in the print room – arsenic, mercury and lead in traditional etching grounds which can be absorbed through the skin, vapours and gases given off by solvents and mordants which can cause all kinds of lung and central nervous system problems. To avoid as many health hazards as possible, Andrew has researched and/or reinvented virtually every substance used by etchers, from degreasing solutions to aquatints, from stopping out to etching grounds. It’s his new ground, Baldwin’s Intaglio Ground (BIG) which is the real news however; a ground which can be used as hard, soft and liquid and which is completely non-toxic. Check out his video here. Over the course of the weekend workshop, Andrew showed us as many of his non-toxic techniques as he was able to pack into two days; intense information upload! Topics covered include plate preparation, using hard and soft grounds, stopping out techniques using BIG and Copydex, sand paper aquatints, poor man’s mezzotint, blue guitar process, icing sugar aquatints, instant coffee sugar lift, etching mordants and how they work, spit bite, plate registration techniques, double drop printing… We even managed to fit in some etching of our own! We each made a three-plate sandpaper aquatint. I think it was his mission to tell us everything there is to know about etching! Although there was quite a lot of basic information given, it filled in a few gaps for me, and I learnt new stuff too. I’m particularly keen to try printing some of my portraits double drop as I’ve been thinking about how to get some colour into my work for a while. For those who aren’t familiar with the technique, this provides a way of bringing some subtle colour to the work by printing the same plate twice on the same piece of paper but in two different colours. The best registration in the world is never going to be perfect and it’s the interplay of the two colours very slightly misregistered which give the image its quality. Now I’m looking forward to some solid studio time so I can apply some of this new knowledge to my own work.